50th Edition : January 2018. The Indonesian feedlot industry continues to slip downwards into a position where their business is simply unsustainable. The indicator price has fallen once again this month to Rp38,000 per kg live weight for slaughter steers. The range now extends from as low as Rp37,000 per kg to as high as Rp40,000 for those with the perfect article in small numbers. And the Aussie dollar is proving to be particularly unhelpful with the rate rising and staying high throughout January. Northern cattle prices have at least continued to stay stable for the first wet season ever with feeder steers in the NT holding fairly steady at around $3.20 kg. 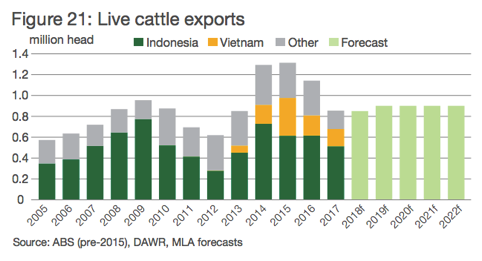 The Indonesian problem is all about supply as Indian beef continues to disrupt the market. Firstly, Indian beef took about 50% of the live cattle fresh meat market by capturing the bakso ball and low end food service sector’s business who’s customers either can’t tell the difference between fresh beef and frozen buffalo (in a bakso ball) or just don’t care because its so cheap. The local Beef Rendang has traditionally been made using the very tough meat from local cattle and buffalo so tough old Indian buffalo isn’t dramatically different. The second significant impact is now becoming evident as meat wholesalers modify their sourcing habits for those items which can’t be supplied from India. The health protocol for exporting from countries with Foot and Mouth Disease (FMD) demands that only boneless meat is safe to export. As no bones or offals can be imported from India, these products have until recently been supplied through a combination of the fresh beef market of locally killed cattle and imported frozen product. What appears to be happening now is that the price of frozen, imported offals and bone-in cuts (from Australia and NZ) is so much more attractive that rising levels of imports of these items are now taking a greater share of the remaining fresh meat/offal/bone-in market driving demand for live slaughter cattle even lower. The graph below from the MLA shows the steady reduction in imports over recent years with Indian beef driving the more recent and more significant reductions. What doesn’t seem to fit is that we are continually told that demand for slaughter cattle (imported) has reduced by around 50% but the numbers imported during 2017, with the full impact of Indian beef in effect, appears below as only a 16% reduction. The only explanation I can think of is that importers are being overly optimistic in their sales projections and continuing to import more cattle than they can sell. This would account for the observation that large numbers of overfat cattle have frequently been retained in feedlots forcing them to be sold at discounted rates in order to prevent further losses. If this is the case then importers will continue to reduce their import numbers until they reach a more sustainable input/output feedlot situation. If reductions in demand for fresh beef as a result of the rising imports of frozen offals and bone-in product continue, the future correction to imported numbers is likely to be rather dramatic. Official reports from the Indonesian government advised that the consumption of Indian beef during 2017 was in the order of 36,000 tons. If we use a bone out carcase weight of slaughter cattle of 220kg then this 36k tons can potentially replace about 160,000 head of live slaughter cattle. But the number of imported cattle only reduced by about 80,000 for the same period which further supports the proposition that importers have not cut back enough to balance the disruption to the supply and demand equation. As more alternative frozen bone-in and offals arrive from Australia, NZ and the USA, the importers position can only continue to deteriorate. Experienced market observers are predicting an Indonesian feeder cattle import number for 2018 of between 200 and 250,000 head. The Indonesian feedlot industry has been in negotiations with the government for a review of the 1 breeder heifer for 5 feeder rule for an extended period. Any hopes for a change in this requirement were dashed during January when an official letter was issued advising all importers that their performance in terms of their required number of imported breeders would be audited at the end of 2018. The letter also stated that the penalty for failing to meet the required target would be the cancellation of their import permits for a period of 12 months. Given that no importers have any hope at all of complying with this requirement it appears that demand for live cattle imports to Indonesia may fall to zero at the beginning of 2019. Bali continues to suffer the consequences of the air travel uncertainty caused by the volcanic eruptions of Mt Agung. A well informed local source told me that Bali has a total of 12,600 visitor beds available with a current occupancy rate of between 15 to 20%. These figures are worse than those experienced following the two Bali bombing incidents. Depressed beef sales reflect this decline in demand for accommodation quite closely. And its all about unpredictable flight schedule disruptions, there is absolutely no danger to visitors from the volcano, only potential for travel delays. So please, take advantage of the great discounts on offer and come to Bali for a holiday, you won’t regret it. 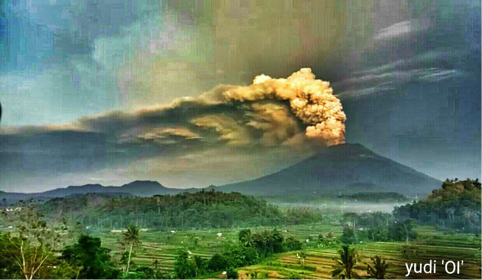 Photo from the internet by Yudi ‘Ol’ of Mt Agung during one of its recent eruptions. Live slaughter cattle prices remain the same as last month with the movement in the AUD price above due solely to the stronger Aussie dollar. Dong 67,000 is still the indicator price for slaughter steers in Ho Chi Minh City. Bulls are selling up to D72,000 in the north while fat heifers are discounted to as low as D61,000 per kg live weight. Imports of live cattle from Australia for 2017 were 165,000 compared to around 190,000 in 2016 and just short of 350,000 in 2015. Considering the very difficult trading conditions in the market today, there appears little hope that there will be any increase in imports unless there is a significant change in the price that can be offered to consumers. 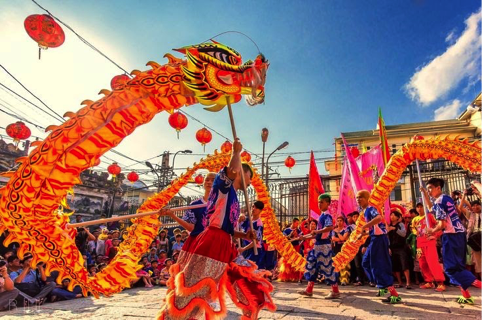 The Tet lunar holiday which starts on the 16th of February will be the only bright spot on the horizon for importers and traders for February. Photo from the internet : Tet lunar new year celebrations. No significant changes in the market this month except that the Baht has weakened against the AUD so a constant indicator price of 100 Baht per kg live weight for slaughter steers now translates to AUD$3.94. Nothing to report about prices here except a minor change in the exchange rate. My agent advises that many supermarkets/hypermarkets no longer sell local or imported fresh meat as the demand is so small. Local consumers appear to be very comfortable buying the broad range of frozen imported beef products which are mainly sourced from New Zealand and India with a small proportion from Australia. 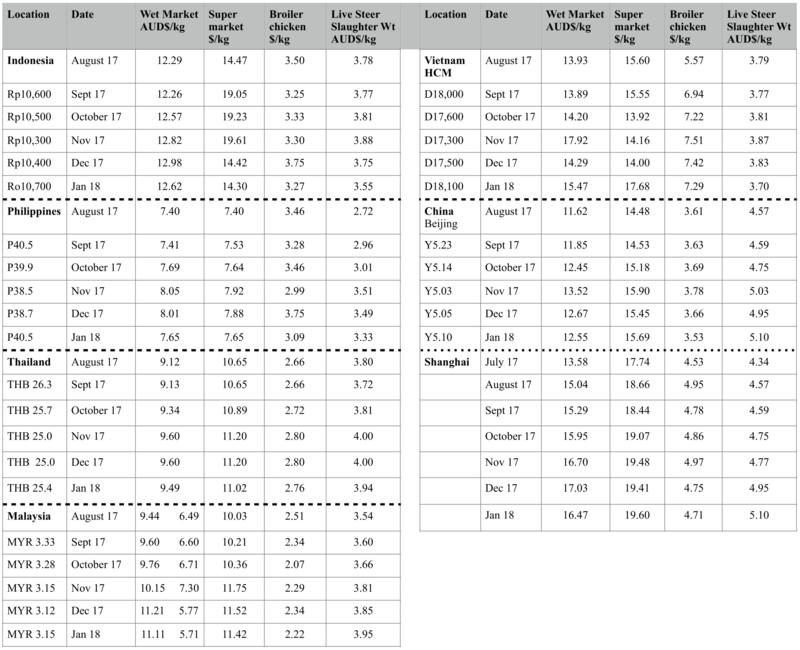 Prices are still firm in the Philippines with the movement in the AUD price only due to the exchange rate fluctuation. My agent continues to report strong economic conditions across the Philippines despite some wild weather and very heavy rains. He also reports a sudden absence of imported Australian and New Zealand beef which leaves only the rather tough local beef in the wet and supermarkets. The Beijing and Shanghai prices both lifted yet again from 25 to 26 Yuan per kg live weight, nudging the AUD converted rate back over the $5 mark. This once again confirms the very different supply and demand characteristics of the Chinese market compared to all the other SE Asian markets that I follow in this report. All the other markets trade slaughter cattle in the relatively tight band of AUD$3.30-4.00 while China’s slaughter cattle consistently sell for around 40% more. And the difference appears to be widening. 500,000 head per year capacity at Ruili on the border with Myanmar in the SW Hunan province. 100,000 head per year in Jiangsu province – north of Shanghai. 200,000 head per year at Kailu, Inner Mongolia. The Ruili cattle will be sourced from Myanmar while the Inner Mongolian cattle will be locally bred. The two plants in Jiangsu and Zhucheng will need 400,000 head annually between them. With many other recently constructed and upgraded beef processing plants along the China coast currently not operational because of a shortage of slaughter cattle, and the price of local cattle rising almost every month, the case for the commencement of live imports from Australia continues to build. The only thing required is for the Chinese government to modify their health protocols to delete the impediments that prevent the import process from being commercial. i.e. What does China gain or protect themselves against by insisting that all cattle from imported shipments are slaughtered within a 14 day interval? This is a simple trade barrier, not a sensible biosecurity measure. The problem in trying to predict when there will be a change in attitude by the Chinese government is that changes to the protocol are political decisions rather than commercial or scientific ones. Farmers will have their lobby groups pushing to keep the number of live slaughter cattle imports to an absolute minimum while consumers will be complaining about sharply rising fresh beef prices. If the Chinese can do a deal with the Myanmar government to bring half a million head over the border annually then this might further delay any considerations to opening the gate to Australia. Meanwhile more Australian “trial” shipments continue to dribble into China. 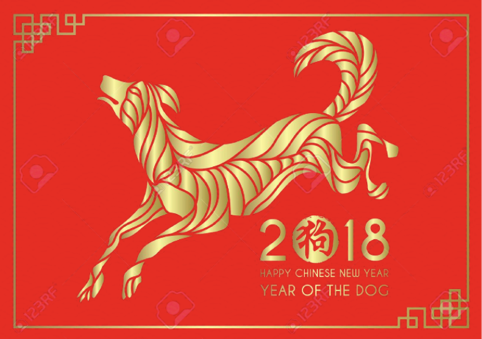 Photo from the internet : Chinese New Year : 16th of February2018, the year of the Dog.